Help increase minority involvement in clinical trials by building relationships with providers and encouraging them to raise patient awareness about clinical trial opportunities. Download the distribution guide to learn how MIMICT can be used to overcome provider concerns about referring patients to clinical trials. 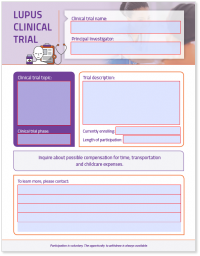 Tailor MIMICT customizable materials to facilitate relationship building with health care providers by educating them about the value of clinical trials to their patients’ treatment outcomes. This project was supported by Grant Number 1 CPIMP171138 and Grant Number 1 CPIMP181166 from the U.S. Department of Health and Human Services office of Minority Health (HHS, OMH). Its contents are solely the responsibility of the authors and do not necessarily represent the official views of the HHS, OMH.